MediHemp is based in Austria and makes some of the highest quality CBD products that you can find today. Grown from fully certified organic hemp and never with pesticides, GMOs and other additives, the MediHemp CBD-enriched Olive Oil delivers 6% of pure CBD and CBDA goodness in a perfect 1:1 ratio. MediHemp is the proud and reputable maker of premium-quality CBD oils and other CBD products, “Made in Austria”. There, in the midst of the beautiful Burgenland surrounded by vast pastures of lush green, they grow some of the best European fully certified organic hemp. MediHemp prides itself on their meticulous and careful process which allows them to offer some of the finest quality CBD products. They hand-pick their flowers and never use any pesticides, GMOs or other impurities to make their products. The MediHemp CBD-enriched Olive Oil is made from pure CBD paste (30%) with natural olive oil, which makes for a total CBD content of 6%, amounting to ±600mg CBD + CBDA content. MediHemp CBD-enriched Olive Oil contains an ideal ratio of 1:1 for the product’s CBD and CBDA content. 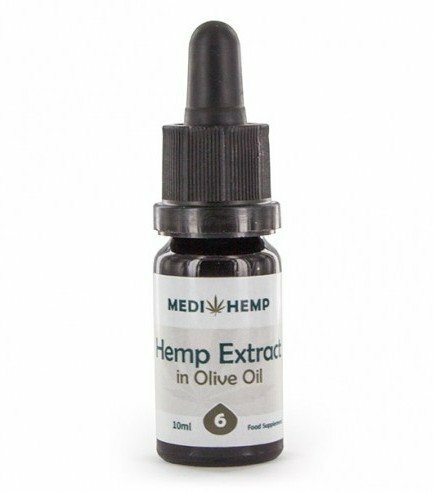 MediHemp CBD-enriched Olive Oil comes in a convenient dropper bottle that makes dosing this CBD product very easy and accurate. The brown glass bottle protects the product from light. MediHemp CBD-enriched Olive Oil is an all-natural product. To avoid spoilage it is recommended that you store the oil in a cool and dark place to preserve freshness.